The bison herd at Fermi National Accelerator Laboratory (Fermilab) just got a little bigger. 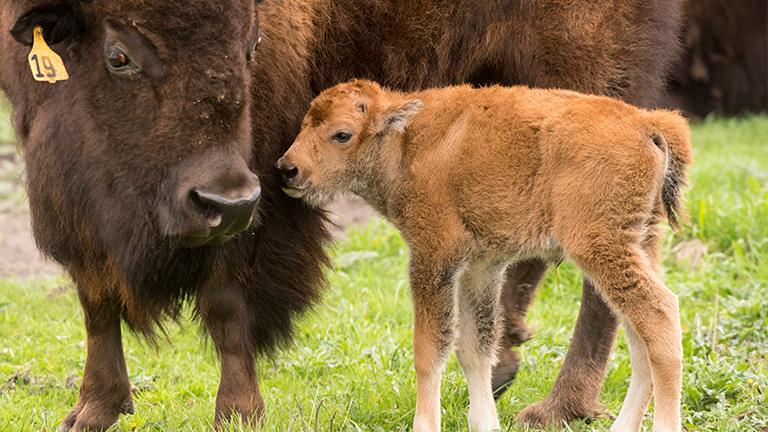 On Tuesday, the first bison calf of 2016 was born at the particle physics laboratory located in suburban Batavia, roughly 35 miles from Chicago. The baby bison brings Fermilab’s current herd to 18. The laboratory said up to 14 additional bison calves could be on their way, as the herd is composed of 15 female and two male bison. Fermilab’s roads and grounds crew, which looks after the bison, has yet to determine the calf’s gender. A national laboratory dedicated to high-energy particle physics may not seem a likely setting for a wild bison population, but Fermilab’s first director, Robert Wilson, had a metaphorical mission in mind when he established the first herd of five bison in 1969. Fermilab has 6,800 acres of diverse natural habitat, ranging from tall-grass prairie where the bison roam to restored wetlands and marshes where a variety of butterflies, birds and amphibians can be found. The resident herd is comprised of plains bison, one of two surviving subspecies of American bison. They are smaller than wood bison, which are found in northern Canada. Via genetic testing, Fermilab recently confirmed its herd is made up of 100-percent purebred, wild bison. This came as a pleasant surprise to the lab, considering the bison population in America was once hunted to near-extinction. By the late 19th century, less than 600 individual bison lived in America. During this time, farmers bred their bison with cattle in order to propagate the dwindling species. The current bison population in America has rebounded to approximately 220,000 individuals thanks to private and public conservation programs, but it's likely that many aren't purebred. The adult bison at Fermilab can reach a height of more than five feet and weigh around 2,500 pounds. They’re capable of running at speeds of 30 mph. While Salles said the animals are “gentle,” their area is enclosed by two fences. The bison herd is an unusual attraction that serves as a gateway for those who may not have a burning curiosity for something like particle accelerators: come for the bison, stay for the science. Fermilab is open to the public every day from 8 a.m. to 8 p.m. Admission is free, but visitors must provide valid photo ID to enter the site. Public tours, which include the bison field, are offered every Wednesday at 10:30 a.m.
February 23, 2015: There are bison once again roaming Illinois prairies. It's been more than 175 years since the last wild bison died in this state, but as of October they are back, thanks to The Nature Conservancy project in western Illinois called Nachusa Grasslands.